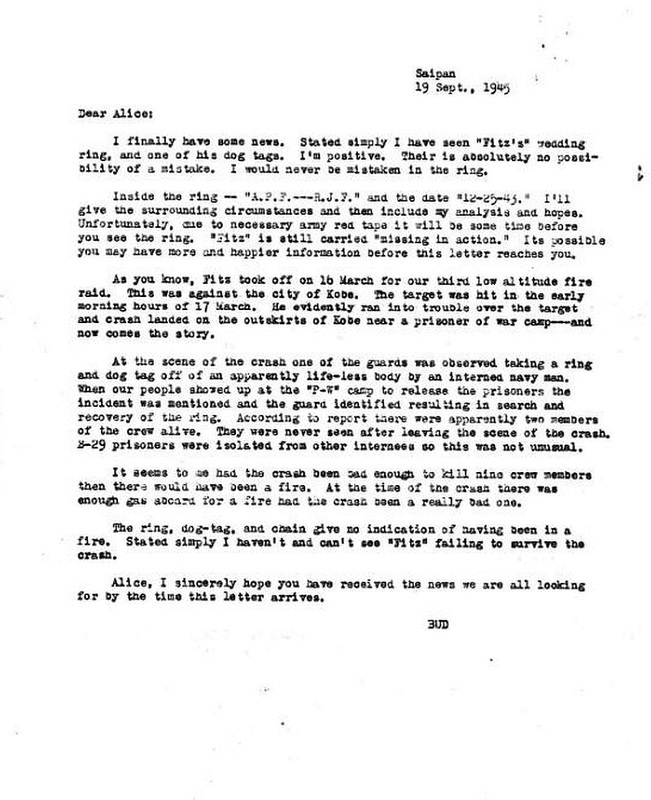 Herschel W. Connor of Z-8, "Mission to Albuquerque"
On March 29, 1945 – quite touching – Luke [George Lucas, Z-8 Crew Chief] tells Dad that he thinks Fitz would have come back if Dad had been along. There is no finer compliment he could have received from his good friend, but both men knew that was just wishful thinking. Of course, we know now that there is nothing that Dad or anyone else could have done to change the outcome, but after a tragedy we always second guess. It is how we deal with grief. At that time – just a couple weeks later no one really knew. Dad had said he did not know exactly what happened to his crew until he read the article in The Retired Officer Magazine in the 1990s. Touching sentiments from Linda Connor Sledge regarding the recollections of her father. him by Crew Chief George Lucas the night he was KIA. 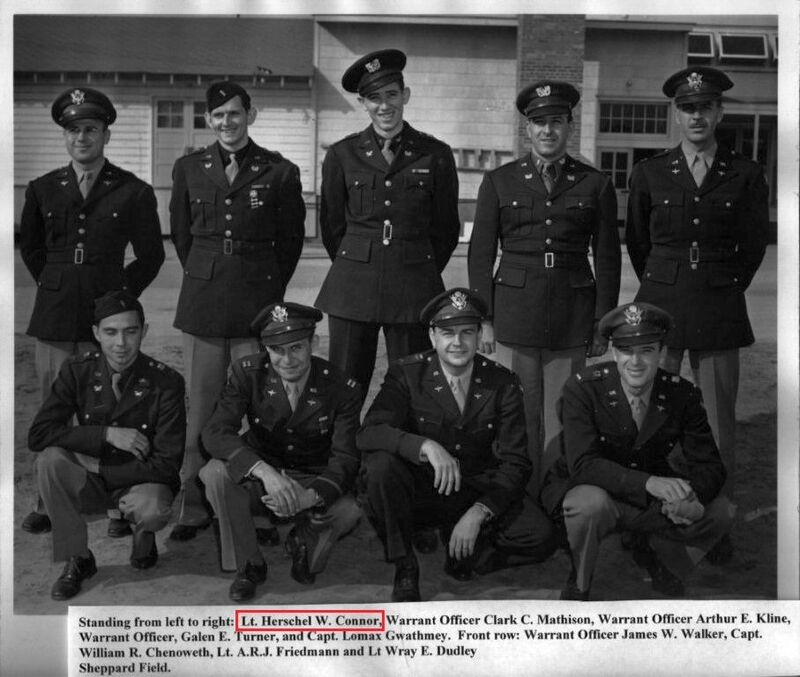 Herschel Connor was one of the original members of the Robert Fitzgerald B-29 crew formed in Victoria Kansas in May 1944. He would fly nine accredited bombing missions w/the Fitz crew before being promoted to captain and to wing headquarters on Siapan for his meritorious service as a flight engineer. Poignant statement from Linda Connor Sledge about what her father probably felt when he wrote the following letter to Alice Fitzgerald......."It captures what dad was feeling. Dad was ever the optimist and very positive in his outlook on life. That spirit comes through in how hopeful he was that Fitzgerald would make it home despite the odds." Diary entry 16 March 45. 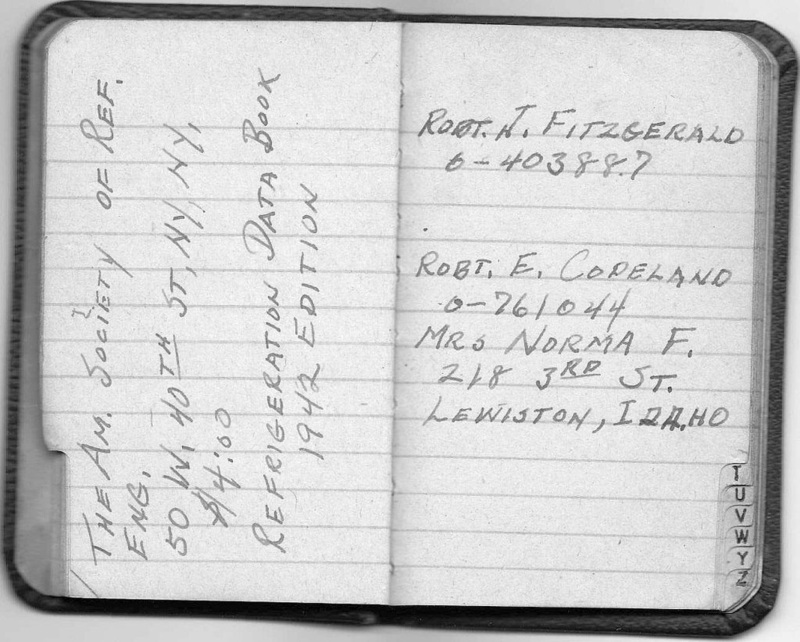 This daily diary entry expresses the respect and fondness that captain Connor felt for his A/C Robert Fitzgerald and the crew of the Z square 8. It was Fitz who insisted that captain Connor leave his crew and take the promotion to wing headquarters, thus saving his life. Diary entry 17 March 45. 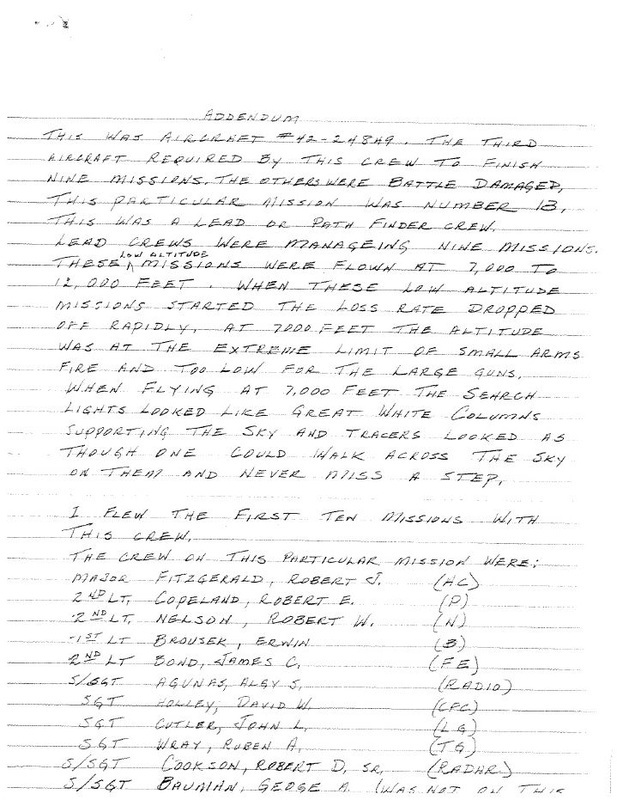 This diary entry relates to the loss of his crew over Kobe 17 March 1945. 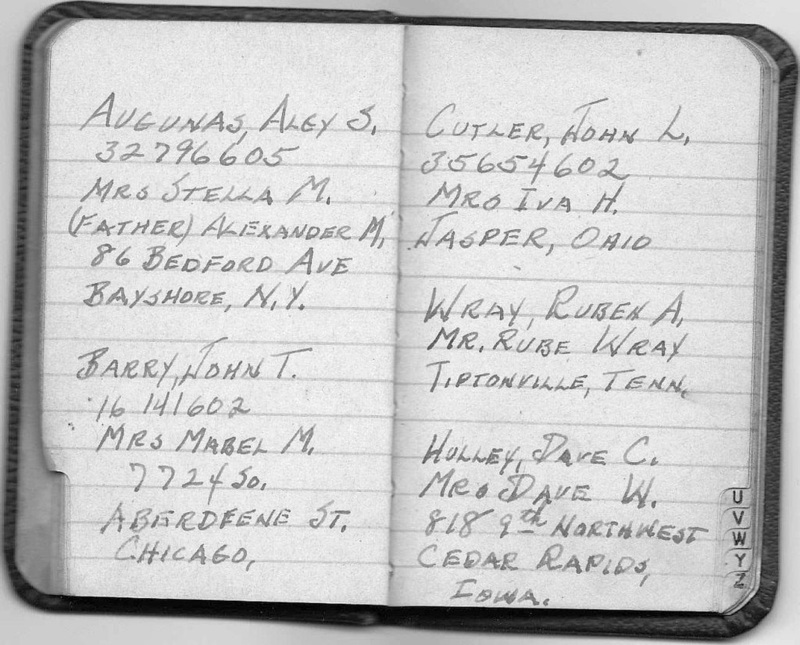 Herschel Connor was born March 13, 1913 in Lewistown Township, Illinois to Ralph and Blanche Connor. Canton, Illinois. 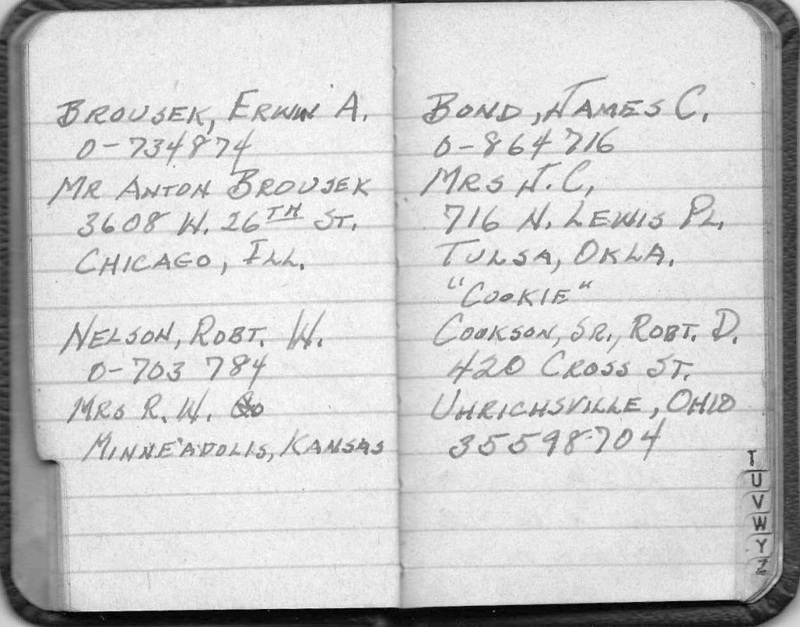 He stayed in Texas to help his Aunt Mamie and Uncle Francis Peitz. He always claimed Aunt Mamie bribed him to stay with a bicycle, but Aunt Mamie promised his mother she would make sure he got an education. A promise that she kept. Herschel graduated in 1931 from Oak Cliff High School in Dallas. In high school he was a member of the ROTC, the Rifle Team, and the football team. Following high school he worked with his uncle as a plumber’s apprentice. Four years later he started college. Herschel attended Texas A&M where he was a member of the Corp of Cadets. He graduated in 1940 with a degree in Mechanical Engineering. Upon graduation he was commissioned a 2nd Lt in the Army Engineer Reserves. Engineer B29 Training at Lowery Field, CO. , and Combat Crew and Lead Crew Training, Walker AFB, Kansas. “Mission to Albuequerque” led by A/C Major Robert Fitzgerald. They arrived on Saipan Nov. 1944 and participated in the first raid over Tokyo later that month. He flew 10 combat missions with this crew. 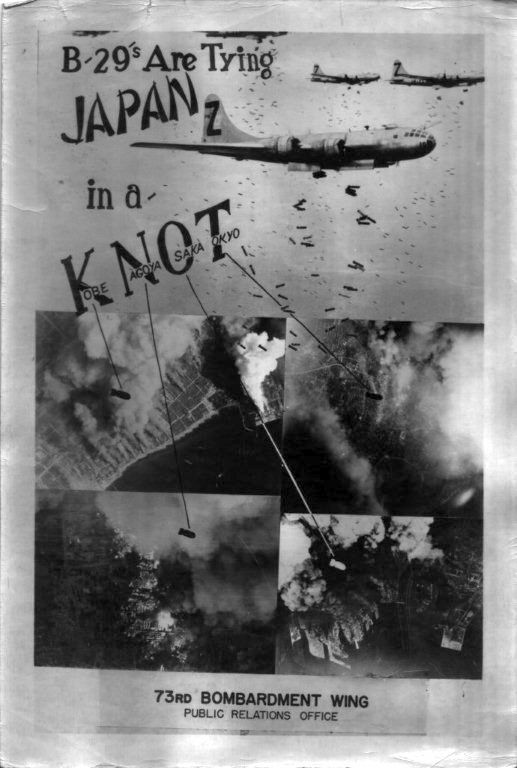 The “Mission to Albuquerque” often assisted damaged aircraft on the return trip home. escorted it back to Saipan where it fell apart on landing. The mission flew for 17:45 hours on 14 hours of fuel. 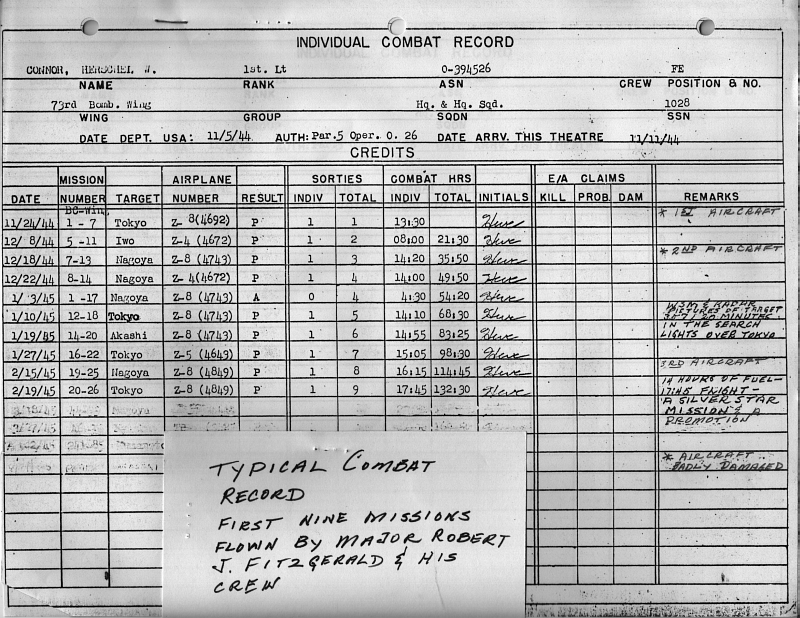 For this flight and others Maj. Fitzgerald received the Silver Star and Herschel was promoted to Captain and reassigned to Wing Headquarters. He told Maj. Fitzgerald that he did not want to leave the crew, but Maj. Fitzgerald insisted that he go, a move that saved his life. A month later his crew was downed over enemy lines and never returned. investigating mechanical failures on combat missions. When needed he flew with other crews . He had a smile for everyone he met. He was the kind of fellow who was there when you needed help and was well liked by his friends and co-workers. He was smart, independent, optimistic, quiet and reserved, not unlike his peers of the Greatest Generation. He did not talk often about the war, but when he did he always spoke fondly of Robert Fitzgerald and his crew. He was always aware how close he came to losing his life with his crew and never forgot them. and catching up with old friends and meeting new ones who had shared much of the same history. After the war he worked for International Harvester in experimental design and then with Caterpillar Tractor Co. in tool design. 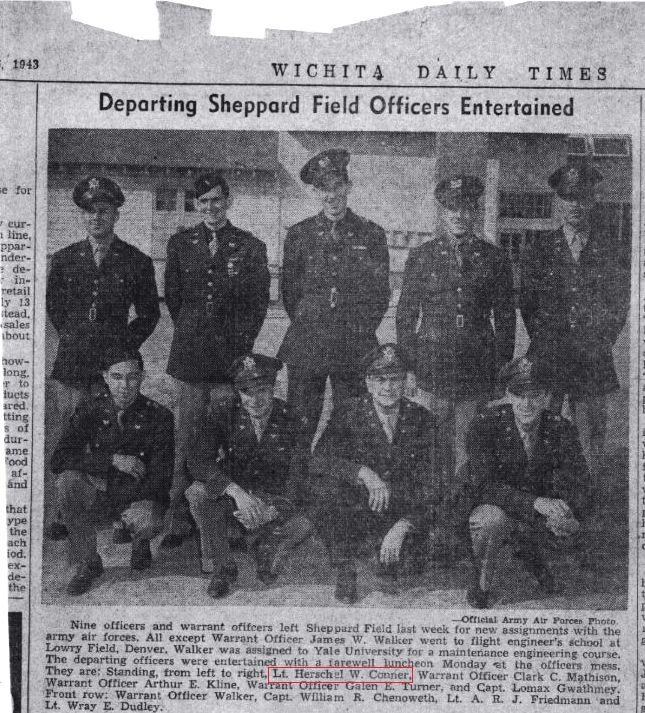 He was called back to active duty during the Korean War to Chanute AFB, 3499th Technical Training Group as a Flight Instructor. He later returned to Dallas, TX to work for Chance Vought, an aerospace company, as an engineer at their manufacturing plant in Grand Prairie. In the early 60’s he took a job as a mechanical engineer for NASA and worked on the SATURN V rocket booster. His career in the space industry included working on the Gemini, Apollo, and Space Shuttle programs. He retired from NASA at the George C. Marshall Space Flight Center, Huntsville, following the first Shuttle mission. Boy Scouts for his volunteer service. He enjoyed being on the water, boating and fishing. He passed away in 2003 at the age of 90 and was buried with Military Honors. 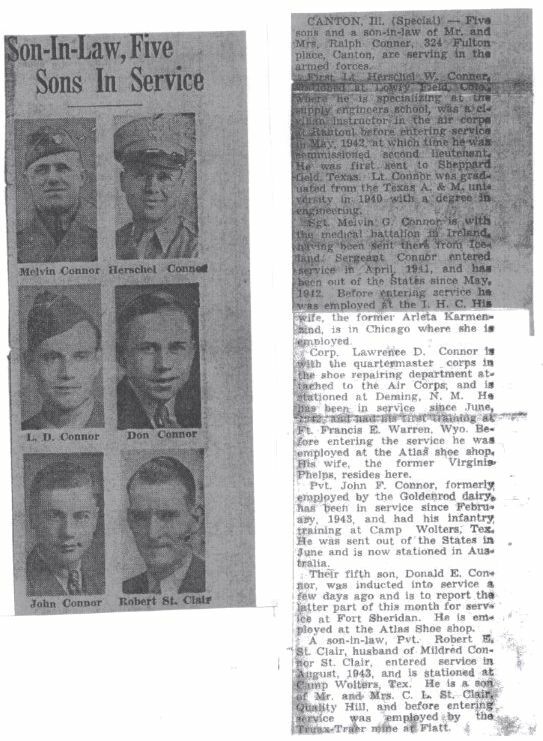 The American spirit shown brightly for the Connor family during WWII as evidenced by this article. John Connor was KIA during the battle for the Phillipine Islands. Commanding General James E. Chaney, Western Pacific Base Command, touring Isley Field, Saipan 1945. Capt. Herschel Connor, with back to camera, is escorting the "brass"
Our sincere thanks to Linda Connor Sledge and Herschel Connor Jr. for their diligence in providing all of the information on this page about their father. Their willingness to help has filled in many of the blanks about the fate of Maj. Fitzgerald, our Uncle Bob, and the crew of the Z Square 8, "Mission to Albuequerque"